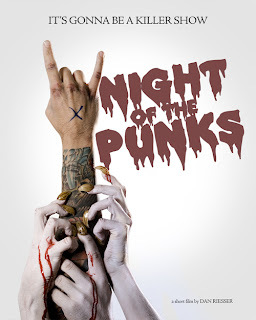 Oxford Film Festival Take 5 With...: Take 5 with "Night of the Punks"
Take 5 with "Night of the Punks"
Meet Take 5 filmmaker, Dan Riesser, director of "Night of the Punks," playing on Friday at 10 p.m. in the late night block. 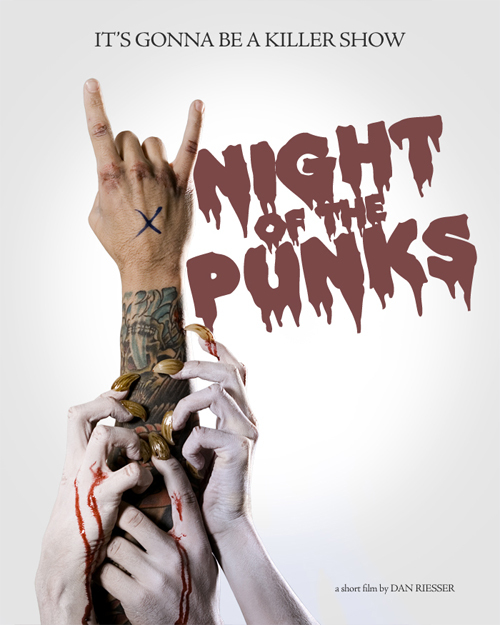 A: Night of the Punks is a fast, gory, funny horror short and a great throwback to 80's punk rock horror cinema! A: The biggest lesson I learned was: When tackling big makeup and special FX jobs that are out of your realm of experience, hire someone who can handle them! Don't try to tackle them yourself if you know you can't pull them off. I hired a kickass group of makeup & FX people, and it shows in the final product. Best part of getting the film made was getting all the positive feedback - lots of punk rock & horror purists have championed the short, it's gotten a great reception at festivals, and gotten some killer reviews! A: I've been making shorts, web sketches, and videos for a long time. I didn't study at a traditional film school, but more so tweaked a broadcasting curriculum in order to make films. I studied film for a semester in Prague at the world famous FAMU Film School. I work in cable comedy television as a producer and NOTP is my third horror short. A: We are currently polishing up the feature length draft and seeking the funds to turn NOTP into a full fledged horror feature. The dream would be to turn the short into a big, crazy, bloody, funny 80's throwback horror film. A: Hopefully some more festivals and like I said in #4, turning it into a feature. I plan to direct my first feature by 2012.